I had a great weekend ,Elton john concert was great and fun on Saturday night @ Richmond coliseum, then shopping @ williamsburg outlet mall on Sunday. I found this purple potato @ super H market / Korean in Fairfax,VA I just have a chance to use up yesterday before it's going bad. ready to serve as side dish for your carb on the plate,serve with any veggies,seafood or meat dishes. By adding some cabbage and light cheese you have made it a healthy bowl of mashed potato. This looks great. 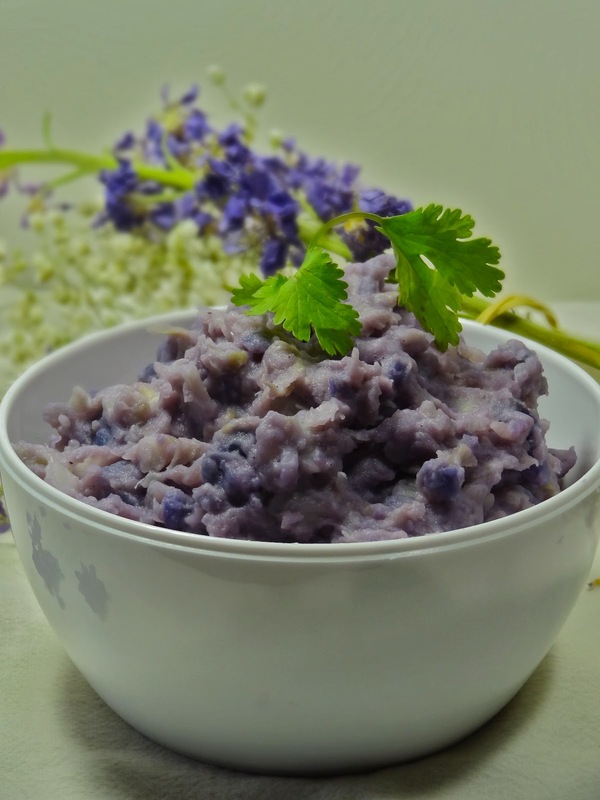 Sort of a purple version of the Irish Colcannon. We seldom get purple potatoes over here but sure why not with the US ones. The local potatoes does not work for mashing for I have tried before. Lovely and you know I have this high weakness for potatoes, so whats stopping me from drooling over this recipe you have shared. I love the color of purple potatoes, and this looks delicious! Sounds like you had an awesome weekend. This purple potato mash looks so unique with its beautiful colour. This looks like a pretty and yummy mash. Though I have never tried purple potatoes...would love to, some day. I have seen purple potatoes but have yet to cook with them. Your blend here with the cabbage does look inviting. I may need to pick up some of those potatoes next go round. Delicious recipe! Lovely photos. I thought the same as Anita (Hungry Couple) it sounds like purple colcannon to me!